A reduction in vision in one or both eyes which is still present even after correction of long or short-sight by glasses is known as amblyopia ('lazy eye'). Amblyopia can also be caused be a squint (misalignment of the eyes), an abnormality of the eye itself (such as a childhood cataract) or by obstruction of the vision (for instance, by a droopy upper eyelid - ptosis). 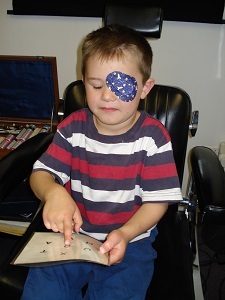 The main treatment for amblyopia is patching of the better-seeing eye for a number of hours each day. The earlier in a childs life this can be started, the more effective it will be. By the age of 8 most cases of amblyopia will not respond to patching treatment, although some improvement can be seen in amblyopia due to long sight, even when patching is started later than this. There are two types of patches: disposable and re-usable. Occasionally children are allergic to the patches and if the skin around the eye becomes sore, you can try a different type of patch or try using a barrier cream before applying the patch. Modern patches come in many colours and patterns and can be quite appealing to children, especially when used with reward charts. The best results are often achieved by patching when your child is in nursery or school. Many teachers are used to children having patching treatment and the distraction of friends and lessons is more effective than at home. The better the child complies with the patching, the quicker and better the improvement in vision will be. For this reason, children who are having patching are offered regular orthoptic appointments, which will provide positive feedback for the child - and support for the parents! Despite the best encouragement, some younger children will not tolerate wearing a patch. This occurs especially when the vision in the amblyopic eye is very poor. The ophthalmologist may then suggest other forms of amblyopia therapy such as atropine drops (which blur the vision in the better seeing eye) or optical penalisation (a reduced glasses prescription in the better eye) - or a combination of both. This can work well in some children but tends not to be as effective as patching therapy. More information about amblyopia can be found here. Patches are not generally available from pharmacies or opticians, however they are easily available online. Ortopad patches can be purchased from Orthoptic Supplies. The M'eye Patch is available from M'eye Patch. The Kay Fun Patch is available from Kay Fun Patch. Krafty eye Patch kits (latex free) are available from Krafty eye Patches. A variety of patches of both types are also avialable from Amazon UK.